I've noticed that with certain dishes people tend to stick with their "tried and true" recipe and never deviate from them and a homemade chili recipe is a perfect example of that. Well, every once in a while a change is refreshing and sometimes that change becomes the new "tried and true" recipe. With nice big chunks of grilled Sirloin Steak and Hot Sausage I think this smoky BBQ Texas Chili recipe might just be the one to replace that old recipe. You'll want a large cast iron pot like the one above or dutch oven to cook this in since it's going on your gas grill or charcoal BBQ. 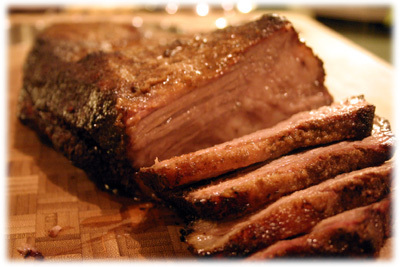 And if you've got hickory smoking wood or pellets definitely use them for extra flavor. Here's a link about how to smoke woods on gas or charcoal. 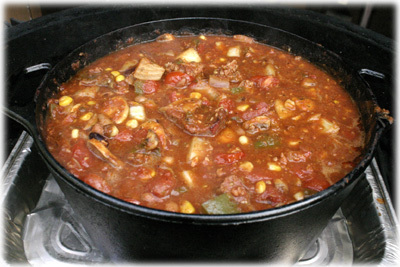 This chili recipe also calls for 1/2 cup of BBQ sauce, try to use one of the hickory smoked flavored ones if you can, there's also a link below to a Smoky Maple BBQ sauce on this site you might like. 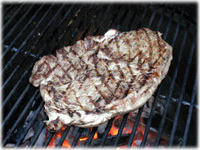 Grill the sirloin steak over very high heat until it's rare with an internal temperature of 125F. This should only take a few minutes each side and give the steak nice grill marks. The steak will continue to cook later when it's in the chili. 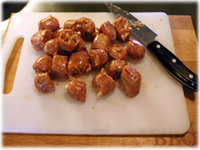 Slice the sausage into 1" pieces. 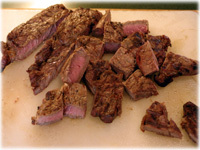 Slice the cooked steak into 1" cubes. Place all the ingredients including the sausage and steak into a large cast iron pot or dutch oven. Set up the BBQ or grill for indirect cooking and preheat to 275F - 300F. 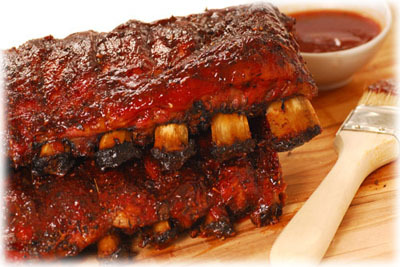 If using smoking woods or pellets put them in the BBQ once it's reached cooking temperature. 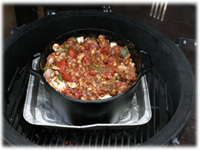 Place the pot of chili on the BBQ with the lid off and cook for 1/2 hour. I use a disposable aluminum pan under the pot just to catch any drippings. Note, it may look "dry" now like the picture on the right but it gets "wet" fairly quickly with all those tomatoes, see below. After 1/2 an hour put the lid on and continue cooking another 3 1/2 hours, stirring several times during this time.